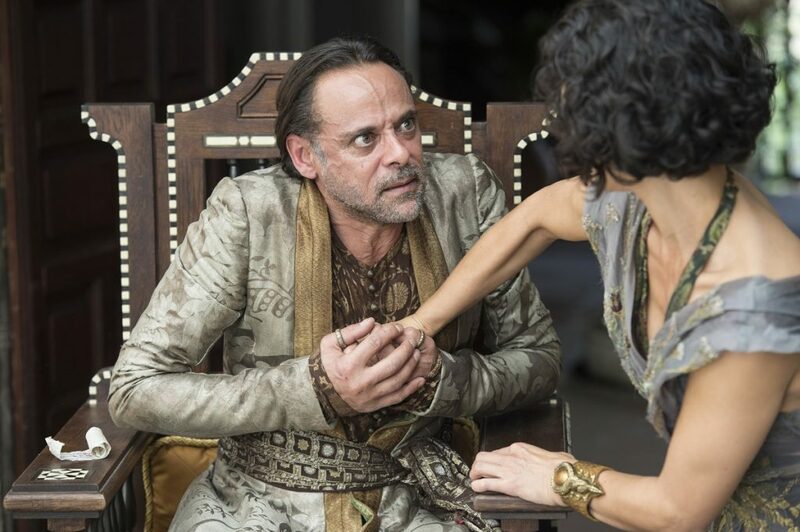 Pictured: Alexander Siddig, Indira Varma in Season 6, episode 1 of Game of Thrones. Photo Credit: Macall B. Polay/courtesy of HBO. “Your son is weak, and weak men will never rule Dorne again.” Ellaria Sand’s (Indira Varma) lingering words aptly summarize the theme of this episode, and perhaps this season so far. After she and the mutinous Sand Snakes murder Doran Martell (Alexander Siddig) and his son Trystane (Toby Sebastian) — one with a stab to the heart, the other a spear to the skull — it appears that women may be the powerhouses of Season 6. And while Margaery Tyrell (Natalie Dormer) may be the victim of Septa Unella (aka Nurse Ratchet, played by Hannah Waddingham) in King’s Landing, her gorgeous blue eyes, which hold a sea of mystery inside them, suggest she may have some tricks up her sleeve as well. Far away in Essos, Daenerys Targaryen (Emilia Clarke) is being held prisoner after her reunion with the Dothraki didn’t go as planned. As widow of the great Khal Drogo, Daenerys thought her reputation would help her. But thanks to her big mouth and Khal Moro’s (Joe Naufahu) respect for tradition, she has to join the Dosh Khaleen — a highly respected ruling group of crones who preside over the holy city of Vaes Dothrak. (Thanks for warning her ahead of time, Drogo!) So Daenerys has to live out the rest of her days among the widows of other dead Khals — unless her dragons can save her again. It’s better than being raped and killed, but for the first time in a while we’re not sure of Dany’s fate, and that’s kind of refreshing. Pictured: Khal Moro (Joe Naufahu) and Daenerys (Emilia Clarke) in GoT‘s Season 6, episode 1. Photo Credit: Macall B. Polay/courtesy of HBO. You’ve got to feel bad for Tyrion Lannister (Peter Dinklage). He spent most of last season trying to find Daenerys only to be abandoned by her (like the rest of the city). And what’s he left with? Angry citizens who don’t like or understand him (insert baby-eating joke here) and a bunch of burning ships. This volatile powder keg will definitely test Tyrion’s political skills, but he seems weirdly optimistic — and we’re excited to see how he thinks his way out of this impasse. Lucky for Sansa Stark (Sophie Turner) and Theon “Reek” Greyjoy (Alfie Allen) in Winterfell, they actually have someone to save their sorry skins. Season 6 picks up after their leap from the bell tower with Brienne of Tarth (Gwendoline Christie) and a trained-up Pod (Daniel Portman) coming to the rescue. After Arya Stark (Maisie Williams) rejected Brienne and Sansa dissed her for creepy Petyr Baelish, this beauty really needed a boost in confidence. All she’s wanted is to protect the Stark girls, and finally she got her chance — great job, Brienne! And now that Sansa’s seen more of the world — and endured Ramsay Bolton’s (Iwan Rheon) penile torture — she finally saw what an idiot she was in the first place for denying Brienne’s offer. Nonetheless, it’s touching when Sansa accepts Brienne’s vow of loyalty and they team up (talk about girl power!). I think this may be one of the best alliances we’ve seen yet and a ray of hope in an otherwise cruel and depressing show. 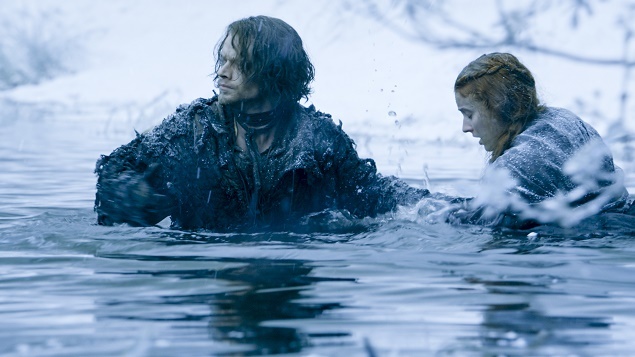 Pictured: Theon Greyjoy (Alfie Allen) and Sansa Stark (Sophie Turner) in GoT‘s Season 6, episode 1. Photo Credit: courtesy of HBO. Iwan Rheon as Ramsay Bolton in GoT‘s Season 6, episode 1. Photo Credit: Helen Sloan/courtesy of HBO. 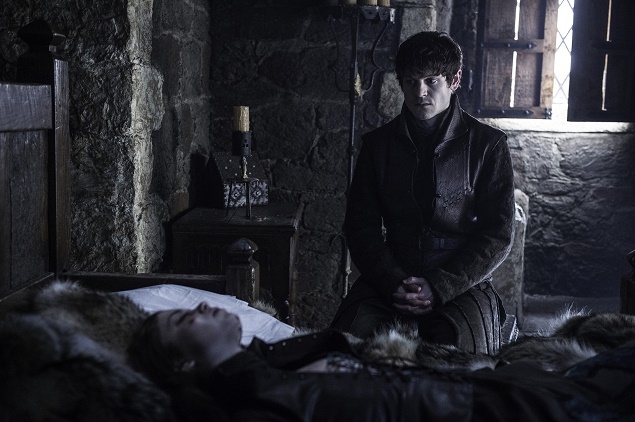 Meanwhile, Ramsay is left behind to mourn his dead girlfriend Myranda (Charlotte Hope). Even this sociopath shows some humanity as he remembers the first time he met Myranda, the only person who wasn’t afraid of him as kids (apparently Ramsay has been terrible all his life). So how does he say goodbye to her? “Feed her to the hounds.” Now that’s true love. Cut to Braavos and poor blind Arya. Arya’s usually the toughest of all the Game of Thrones women, but as Williams said in an interview, “We’ve never seen her this close to giving up.” And it seems Jaqen H’ghar’s (Thomas Wlaschiha) number one sidekick, the Waif (Faye Marsay), is the source of her torment. For about 30 seconds we see her beat Arya with a stick. “See you tomorrow,” she says as she departs. End scene. CUT — now we’re in King’s Landing where last we saw Cersei Lannister (Lena Headey) doing her shameful walk. It’s been a rough couple of months for the lioness and Myrcella’s return is the first good news she’s had. But when she sees Jaime (Nikolaj Coster-Waldau), her brother and lover, sailing into the harbor next to a coffin instead, we know she’s reached her lowest point. We’re starting to realize more and more that Cersei is not a monster as she believes, but a human who loves her children above all else. She only has Jaime left (because let’s face it, Tommen is done for), and she will truly despair if she loses him. “We’re the only ones who matter. And everything they’ve taken from us, we’re going to take back and more,” Jaime says. And the Lannisters always pay their debts. ‘The Red Woman” sets up Season 6 to be the best yet — producers weren’t lying this time. With two shock deaths, Melisandre’s (Carice van Houten) decrepit old body (I’ll get to that in a bit) and Brienne’s awesome fight scene, I don’t think this season will disappoint like the last. The show has finally surpassed the books and it feels good to be surprised again. 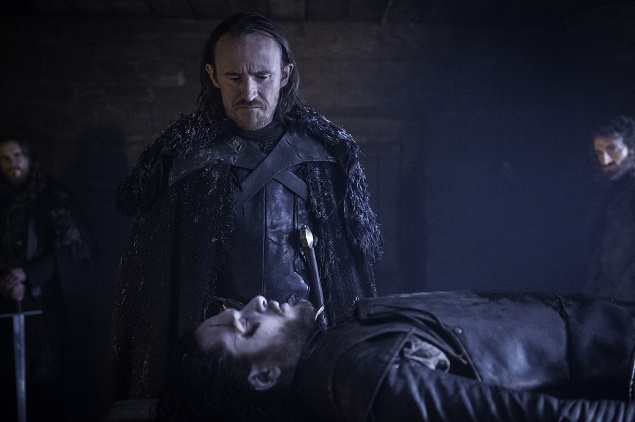 Pictured: Eddison Tollett (Ben Crompton) and Jon Snow (Kit Harington) in GoT‘s Season 6, episode 1. Photo Credit: Helen Sloan/courtesy of HBO. Carice van Houten as the Red Woman in GoT‘s Season 6, episode 1. Photo Credit: courtesy of HBO. When the episode began, you could cut the air with a Valyrian sword — it began at the climax of Season 5, at Castle Black with Jon Snow’s (Kit Harington) body motionless in the snow. After about a year’s worth of questions, rumors and reports about haircuts, book lovers and non-book lovers were watching with bated breath wondering: Is Jon Snow alive? We still don’t know. Yes, we saw Jon’s dead body get stiffer while Ghost howled in despair and Ser Davos (Liam Cunningham) and a few loyalists plotted their next move. But what about Jon’s blood spatter? Some say one moment it looked like a wolf and the next it looked like a dragon. This stokes the theory that Jon will come back to life as a Targaryen when his body is burned. I personally have no doubt he’s coming back — why else would Melisandre have seen him in the flames? Why would he have been the only one to kill a White Walker? All these questions have one simple answer: Jon Snow is not dead (for long), although Melisandre seems less sure of this. 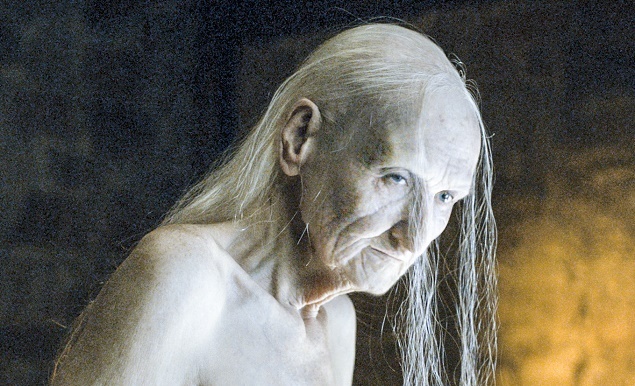 The episode’s bizarre ending shows the title Red Woman depressed and disrobing (what else is new…) and become an old lady. It’s possible her magic choker hides her true age, but one bathtub scene shows she’s removed it before without turning into an old mare. The vial on her nightstand may tell a different story, though. Game of Thrones has been revitalized this season, and Melisandre can only hope that her faith will be revived along with it. Catch an all-new episode of “Game of Thrones” on HBO Sundays at 9 p.m.